✅ Our oil and vinegar sprayer with 2 chambers, 2 hoses with filter, a scale arrow, a locked and unlocked sign. On the ground is rubber material to avoid sliding.It is possible to choose your individual mixture,or between 100% oil and 100% vinegar by twisting the spray head with scale arrow. 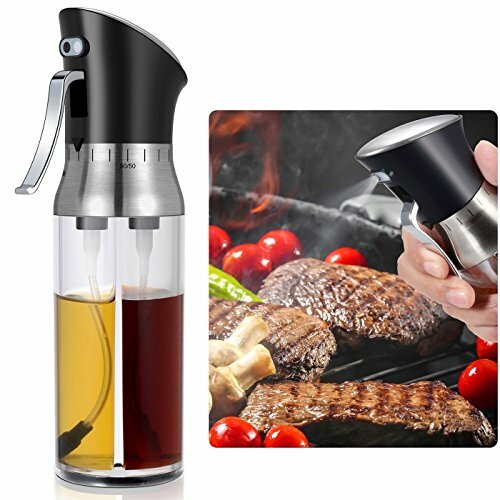 ✅ Our oil sprayer can be used as olive oil sprayer dispenser,water sprayer,vinegar bottle etc.With transparent bottle,you can easily recognize the capacity and dosage,and clearly distinguish all kinds of spices. ✅ 2 in 1 Oil and Vinegar Sprayer- Your choice of Oil! Olive, Sesame, Vegetable... All variations will work with this model. ✅ Adjustable Settings From 100% Oil or 100% Vinegar to a 50/50 Mix of the two together and adjustments in-between. ✅ Great to use while cooking, or adding a healthy mix to your favorite salad. ✅ A quick press on the trigger will allow you to produce an oil mist or slow action will produce a dash of vinaigrette. ✅ Not only is Oil Sprayer easy to refill but it has a drip-less spout so there is no mess. If you have any questions about this product by KKTAU, contact us by completing and submitting the form below. If you are looking for a specif part number, please include it with your message.